You are here: Home | All News Items | Why OpenFOAM®? Why do we choose to use OpenFOAM**® as our CFD solver? As a leading CFD consultancy, TotalSim have chosen OpenFOAM as their CFD solver of choice. The question is why would TotalSim and many others, choose OpenFOAM over commercial CFD solvers? OpenFOAM® is highly competitive technologically with all other commercial solutions currently available, such as ANSYS Fluent®, and is able to give as accurate results and in many cases has faster turnaround times. When TotalSim’s MD Rob Lewis, was head of the CFD team at Honda F1, they had chosen to move away from commercial codes and towards OpenFOAM, despite the huge budgets they have to play within F1. With its open source philosophy it is easily developed. With full access to source codes and support from the TotalSim’s OpenFOAM® developers tailored solutions can be created that are suited to any of our clients needs. OpenFOAM® can fit seamlessly into any development cycle. 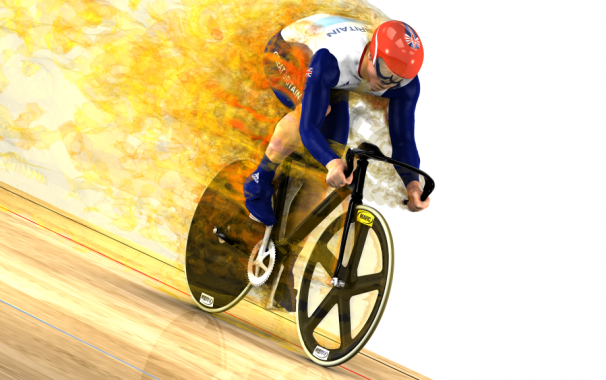 OpenFOAM® simulation of flow around a cyclist using DES. It is easily scriptable, meaning that processes can be fully automated. Once a case has been set up for the first time, changes in geometry or flow conditions can be rapidly tested and compared with previous results. This allows for the effective optimisation of a very wide range of problems. Our current record is 366 different geometries of the same project analysed in 5 working days. Result turnaround speed is highly competitive and when combined with our hardware solutions, can be effectively scaled (with no additional licensing costs) to meet clients’ requirements. Perhaps most importantly OpenFOAM® is 100% free. With zero licensing and initial fees, there is a large reduction in the overall price for a CFD solution. TotalSim can now average at less than £100 per simulation for large (>60M cell models) full detail automotive applications. These savings are transferred directly to the client making CFD very cost efficient as there are no licencing costs that need to be added to the costs of simulation. No wonder so many large organisations are shifting towards OpenFOAM®. The largest downside to working with OpenFOAM® is also its biggest attraction to TotalSim. The lack of a user interface is seen by many as a drawback, but to TotalSim this is unnecessary. TotalSim have developed a slick process that allows for a seamless mesh to postpro solution, reducing the dependency upon a GUI. To find out more about OpenFOAM and how TotalSim could help OpenFOAM work for you then please get in contact. Our OpenFOAM and CFD support can be tailored to you requirements, helping provide everything from OpenFOAM® training and CFD hardware to best practice guidelines. 2 Responses to Why OpenFOAM®?